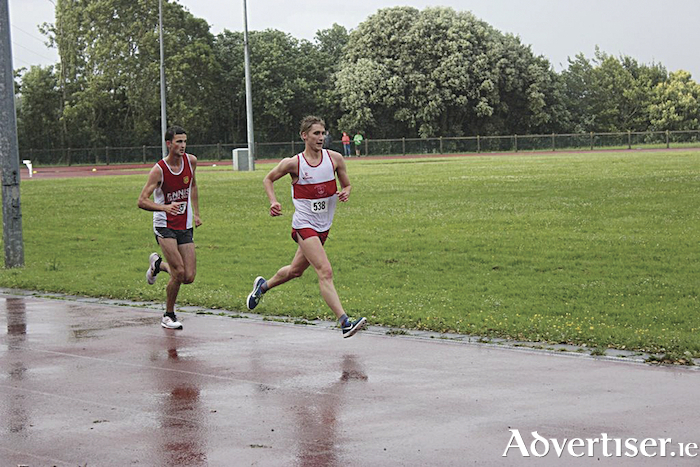 Winner Brendan McDonnell GCH holds off Pat Chesser of Ennis Track AC for victory in the Galway 10,000m. Galway athletes were in top form on the third day of the Galway County track and field championships in Dangan which featured an epic 10,000 metres and a mile race. Brendan McDonnell of GCH won the gruelling 10km, over 25 laps, while Irish international Shona Heaslip of An Riocht AC set a European 10k qualification standard. Despite the torrential showers, the huge crowd were entertained by a great duel at the front, with McDonnell and Pat Chesser of Ennis Track fighting it out for victory. Heaslip ran a very fast second half to clock 32.56 to take first place for women, and a European Championships standard, while Michelle McLoughlin of Castlegar AC took the Galway women's title with a well-paced race. Patrick Noonan won the open mile race for Craughwell AC.